On Thursday, February 20, L’Abattoir will be host to a unique collaboration of two celebrated chefs. 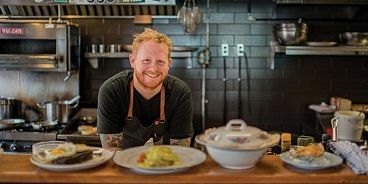 Montreal’s Chef Derek Dammann will work with Chef Lee Cooper and the L’Abattoir culinary team to create a seven-course dinner paired with wines and cocktails. Dammann is one of Montreal’s top chefs. He opened his current venture, Maison Publique, a year ago in partnership with Chef Jamie Oliver and has garnered rave reviews. The upcoming dinner is only one of the exciting things happening at L’Abattoir. The restaurant has also announced that it will open a sleek new private dining space, with bookings starting in late April or early May. Details will be available soon. Seating for the Chef Dammann dinner is limited, so reserve your tickets today by calling 604.568.1701 or emailing info@labattoir.ca. Please note this event is not suitable for vegetarians. About Chef Derek Dammann: Chef Dammann has his finger most assuredly on the pulse of Montreal dining. His previous restaurant, DNA, was a favourite of critics and diners alike. Maison Publique, which he opened just over a year ago in partnership with celebrity chef Jamie Oliver is an ode to social dining— especially if “social” can be interpreted to mean “a packed house.” The atmosphere combines traditional pub charm with the rustic chic of a hunter’s cabin, complete with wall-mounted trophies. It all adds up to an irresistible charm—and a No. 6 ranking on enRoute magazine’s list of Canada’s Best New Restaurants 2013. About L’Abattoir: Located in the centre of Gastown between historic Gaoler’s Mews and Blood Alley, L’Abattoir is located in a 19th-century building that was the site of Vancouver’s first jail. The restaurant’s name pays homage to the neighbourhood’s colourful past. Chef Lee Cooper and General Manager Paul Grunberg are dedicated to highlighting the finer points of eating and drinking in an informal setting. French-influenced West Coast fare is paired with an eclectic wine program and Head Barman Shaun Layton’s innovative cocktail list to offer a truly unique dining experience.